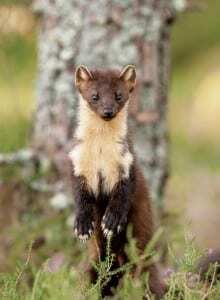 Pine martens have returned to the Cambrian Mountains where they are once again living wild. Two of us from Cambrian Wildwood spent an evening tracking the newly released animals with Vincent Wildlife Trust. On a damp November evening Milly Jackdaw and Simon Ayres of Cambrian Wildwood met up with Dave Bavin of Vincent Wildlife Trust at the Hafod Estate near Devils’ Bridge. 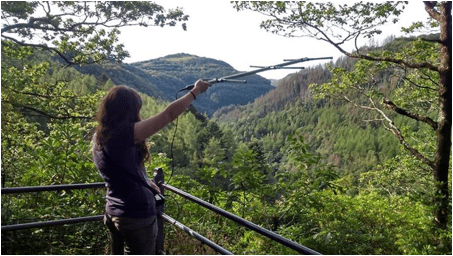 The Pine Marten Recovery Project is an inspirational programme to boost populations of pine marten in different regions across Wales and England. Here in the Cambrian Mountains we are fortunate to be hosting the initial part of this programme, with the first 20 animals now released during the course of this autumn. Tracking is enabled by the radio collar worn by each pine marten, and the receiving equipment. Using GPS the location of the receiver is noted, and using a compass the direction of the signal. By taking at least three of these readings, the position of the animal can be triangulated and marked on a map. In practice it can take some time to pinpoint an animal, either because it is moving, or if the signal is obstructed by a feature in the landscape and provides an inaccurate bearing. You just keep taking readings from different locations until it makes sense. They seem to be establishing territories and it is fascinating to see where the different animals are living. Some have stayed near to the release sites, while most have wandered off elsewhere in the Ceredigion countryside, with one making it to the lower part of the Rheidol valley. One progressed 10km in a straight line during the first 3 hours after being released. At least three have made it across open hill country, with one making it as far as the Dyfi. These are really charismatic animals, and though quite shy, it is not unheard of to spot them in the wild. Their return to mid Wales must surely be welcomed by most people. It remains to be seen what sort of effect they might have on the grey squirrel and consequently on the fate of the red squirrel (see Red Squirrel article). We look forward to the second phase of the project next autumn, when they will be released further north, within the Cambrian Wildwood project area.